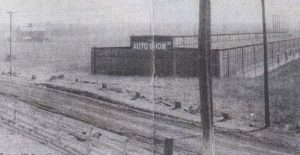 The present day Flowline building was used as a venue for an Auto Show in the Spring of 1922. Shenango Township was incorporated in 1796 as a township in northern Beaver County, Pennsylvania. Shenango was named after a river in Western Pennsylvania, the Shenango River. In 1849, when Lawrence County was formed, Shenango Township became one of Lawrence County’s original townships. It quickly became one of the more populated regions of the county because the land was suitable for many different purposes. One of the first settlers to live in Shenango was William Carins. Carins first came to the township in 1796 and was the man who is credited with giving Shenango Township its name. Carins was awarded the land after his service in the Revolutionary War; he was paid in 500 acres of land. Carins worked as a cloth weaver and ran a small store where he sold his goods. 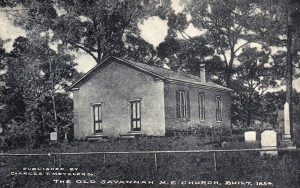 The Original Savannah Methodist Church, located adjacent to the Savannah Methodist Cemetery. William Tindall was another one of Shenango’s first settlers. Tindall was paid 400 acres for his service in the Revolutionary War. He lived to the age of 93 and was buried in the Tindall family cemetery near the “Turkey Hill” section of the township. Shenango’s largest land owner was a Philadelphia lawyer named Benjamin Chew. Chew bought up large portions of the southern extent of the township under assumed names for pennies an acre. He later resold the land for a profit, and the small town of Chewton was later named after him. The township was linked to New Castle, Ellwood and Pittsburgh in 1908 by the Pittsburgh, Harmony, Butler and New Castle Railway, an interurban trolley line. The railway was developed by business partners Russell H. Boggs and Henry Buhl as an adjunct to their department store in Pittsburgh. Mr. Boggs already had a business relationship with many of the farms between Evans City and Pittsburgh and proposed exchanging the right of way across their land for one dollar, a guaranteed trolley stop and an electricity supply. The first trolley ran to Ellwood City on July 2, 1908. At the southern end of the line, Pittsburgh Railways took over the trolley for the run into Pittsburgh, as the final few miles was over their rails. In 1914, an extension along the Beaver Valley was opened. This left Ellwood City heading southwest and crossed the Beaver River on Koppel Bridge which was built for the purpose. This bridge also carried vehicle and pedestrian traffic and was subject to a toll. The line closed on June 15, 1931, and the trolleys were replaced by buses.